We know how important it is for electronics technicians such as yourself to have the most accurate multimeter that you can get, as well as keep you safe during your jobs or projects. That’s why we’ve created this ultimate guide to the best multimeter for electronics technician. Check it out and pick your favorite meter! We picked the top quality multimeters for electronics that are designed for professional, industrial electronic applications as well as everyday use and electrical troubleshooting. Our electronics multimeter reviews were selected based on a number of factors, including quality, features, customer satisfaction, and best value. Most professional multimeters have some additional functions that basic multimeters don’t have, as they are specifically designed for industrial use. The majority of them are also digital multimeters, as those are the ones that can offer some of the most precise and detailed results. For readers’ convenience, the review products below are divided according to the features (hi-end to basic models) and price range. This section will feature high-quality multimeters that are very popular in the electronics technician community. The Fluke brand is one of the most well-liked brands on the market, thanks to its reliable and accurate reads. Here are some of the best Fluke multimeters for electronics. The above Fluke multimeters are the most popular models that workers in the industrial field turn to when tackling some of the most demanding jobs, thanks to their top-notch functions. These multimeters are also built to withstand rugged situations in which they really prove to be incredibly durable. Even though they are on the more expensive end of choices, customers seem to think that they are worth it. 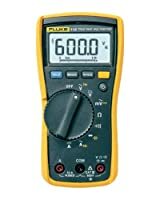 This Fluke electronics multimeter is one of the best out there for professionals in the industrial field due to its high-performance capabilities. It’s definitely one of the more loved models, and people are just amazed at how durable it is. 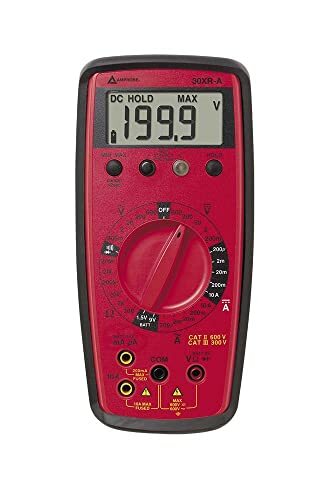 This advanced multimeter has to connect enabled wireless test tools that allow the user to be up to 20 feet away while testing, which increases your personal safety without sacrificing efficiency on the job. In addition to that, this item works with the Fluke Connect mobile app, and users can graphically review up to 10,000 recorded and logged readings with on-board TrendCapture. This model Fluke 287 is designed to figure out very difficult issues in electronics, plant automation, power distribution, and electro-mechanical equipment. It is one of the most highly rated tools of its kind out there based on customer reviews and satisfaction. One of the only downfalls to this multimeter is the fact that it’s extremely expensive compared to some of the other models out there. 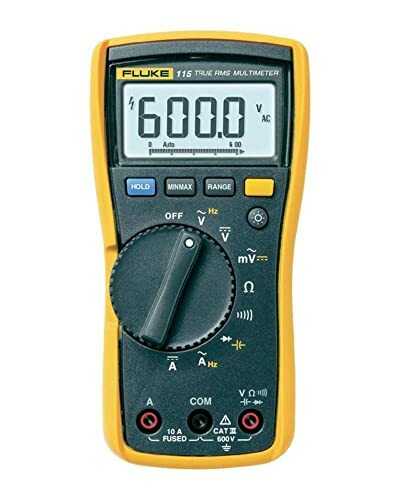 This Fluke 179 multimeter is one of the best general purpose meters for everyday use, and you will find it to be a favorite design among its competitors. It has a ton of desirable features that make it an easy tool to spend some cash on, even if it’s up on the pricier end of things. Not only is it built to thrive in tough, industrial environments, but it also comes with a combo kit that includes a soft carry case, installed 9V battery, temperature probe, test probes, hook clips, user’s’ manual, magnetic meter hanger and more. This meter’s advanced electronic troubleshooting functions are up to date with the latest safety standards as well, so you don’t have to worry as much about getting injured while on the job. 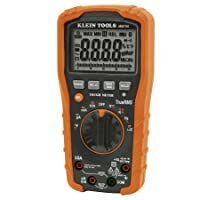 Price-wise, this Fluke multimeter 179 is very comparable to its competitors but has a slightly better value due to being cheaper and coming with more accessories. However, it does not come with a case or a hanging strap, which many other customers wished it had. Here’s another tool that has hit a homerun with professional and advanced casual users. 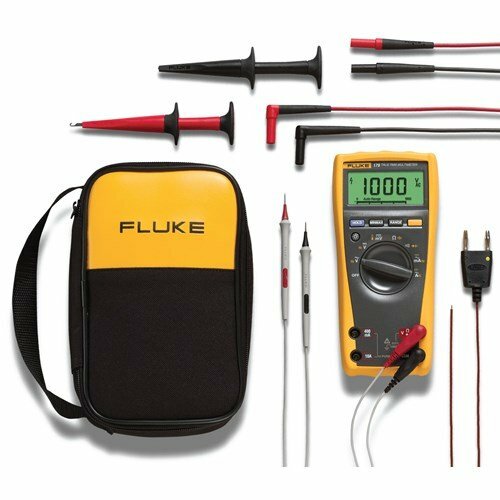 This Fluke digital multimeter is a fantastic compact meter for electronics and field service applications. Compared to two Fluke models above, this Fluke 115 is the cheapest Fluke branded tool in this list, but it is still a wonderful and high rated product when it comes to being worked in an industrial field. Not only does it have True-RMS for accurate measurements on non-linear loads, but it is CAT III 600 V safety rated and can check continuity, frequency, diode test, and capacitance as well. This particular professional multimeter also has a wide variety of field service applications, including more than one kind of electronic troubleshooting. The Fluke 115 multimeter comes with a 9-volt battery, holster, user manual, and a 4mm silicone test lead set. The downfall to this product is that some customers claim that it doesn’t last very long, however, others do. Also, holding readings on this Fluke is a little tougher than with some of the other models. Not everyone wants to spend hundreds of dollars on a multimeter, or maybe new employees to the industry can’t afford to buy a Fluke brand tool. That’s ok! There are plenty of other great options for multimeters on the market that cost less than $100. These models below are all cheaper than Fluke models but also have great qualities to perform in the industrial work environments. When it comes to tools, Klein is one of the brands that users trust the most. 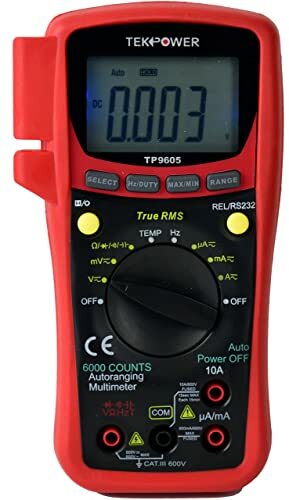 This particular auto-ranging digital multimeter comes with true root mean square technology (True RMS) which increases the accuracy of its readings. Compared to other similar multimeters, this Klein model is built even tougher to withstand a drop over six feet high and continuous daily use. This product measures up to 1000V, 10A AC/DC current and 40MΩ resistance plus temperature, diodes, continuity, frequency, and capacitance. 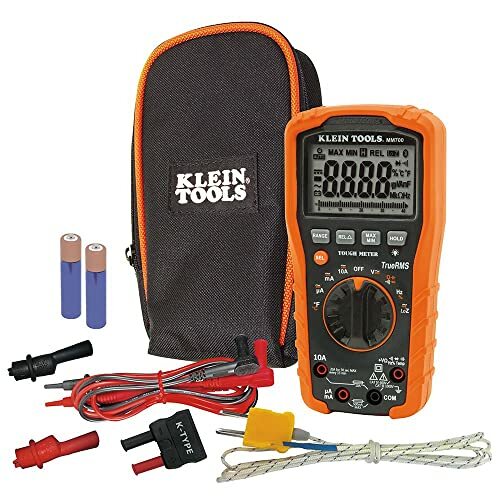 The Klein Tools multimeter MM700 also comes with a set of alligator clip extensions and probes, which makes it a better value than others out there on the market. Previous and current customers are especially fond of this multimeter due to how well it’s built and accurate it is. However, one of the things that could use some improvement on this model is increasing the speed of its readings. The Klein Tools MM700 is a well-designed tool that serves anyone in the construction or industrial field very well. This Amprobe multimeter is also in the under $100 price range, and even comes with a non-contact voltage tester for up to 600V AC. Previous and current customers are super happy with their purchase of their Amprobe, as it’s been found to be reliable, sturdy, and a breeze to learn to use. In addition to that, some of the other features on this Amprobe 30XR-A include a magnet-grip holster with magnetic hanging strap, a continuity beeper, and is fully safety fused to the latest standards. 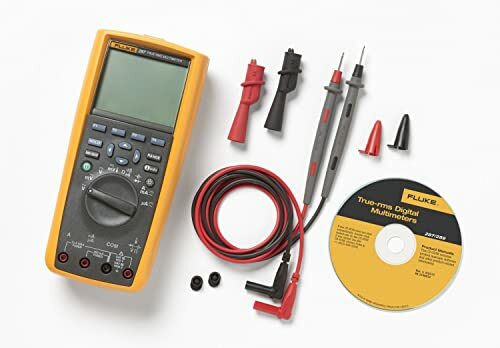 This affordable multimeter for electronics repair is designed to even work on large household appliances and devices such as refrigerators and air conditioners. It can also help with installations of major items too, as this multimeter is capable of performing functions like service panel parts and branch circuits. A small bonus with this product is that it comes with a magnetic strap for hanging the meter on metal doors. One thing that customers have commented on that could be better is that the continuity feature is a bit slow. We understand that money doesn’t grow on trees, and the great news is that you don’t need to have deep pockets to get a reliable tool for work. The following multimeters are best for the serious hobbyist and homeowner with advanced electronics skills. They aren’t as expensive as some of the name brands, however, they are perfect for getting tough jobs done. 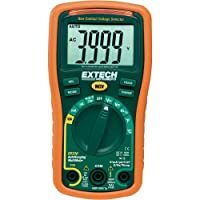 This Extech multimeter is one of the best budget meters out there, as its 4000 count auto-ranging features measures AC/DC voltage and current, duty cycle, resistance, temperature, and frequency. It also includes a Type K temperature probe and comes with a rubber holster to protect the tool. The Extech EX330 Autoranging Multimeter is ideal for electrical troubleshooting and is a fully featured digital multimeter. It is less bulky than other models, but it still has a very easy to read LED display with one-inch digits, an audible beeper, red LED indicator and low battery indicator. Also, a handy feature includes the auto power off function that automatically shuts the meter down after being idle for 15 minutes. 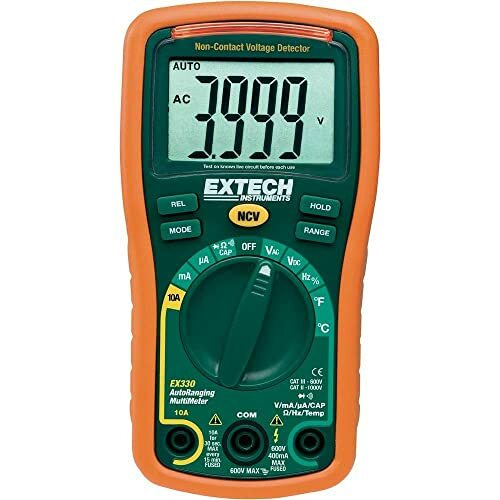 The only downfall that users have found with this Extech multimeter is the fact that you have to be extremely close to a 110V to get any response, due to it being a non-contact voltage detector. Another great budget model is the TekPower Digital meter. It is a good cheap multimeter for serious DIYers, homeowners, and electronics workers. Not only that, but it happens to be the world’s first cellphone connected multimeter that comes with an array of exciting features, including a wired USB connection. This particular model comes with a K-Type thermo probe, test leads, user manual, and PC software and smartphone apps. This allows you to share measurement results with anyone via Facebook, Twitter, or email. In addition to that, it has a backlit screen which makes it easy to use in the dark, along with data hold for easy reading. Compared to other multimeters in this range, this auto ranging Bluetooth multimeter works fantastic for troubleshooting automobiles as well. The one thing that users have found unappealing about this model is the fact that it does not store minimum and maximum values. Based on our selections, we believe that we have found the best multimeter for electronics technician. From the highest top end Fluke models to our best budget multimeters for electronics, there is surely something here for everyone, no matter what field you work in or what type of job you’re planning. Hopefully, these electronics multimeter reviews will help you select the right one for your needs, job, and future projects. And don’t hesitate to share us your thoughts on “What are some things that you look for in a multimeter?” in the comment section below. Want to find a good multimeter for HVAC or automotive use? Choose the best models with our ultimate multimeter reviews. It is a complete article to choosing a best multimeter. I am little bit confused to choosing this power tools. But this article clear my all confusion. This is really valuable and essential to buyers guiding tips. Thanks for your helpful article sharing. I’m a little bit confused about which type of voltmeter is appropriate to measure voltage ranging from 150V to 200V? Analog or digital? Is there any effect of internal resistance? Hi Eric, if you are confused about which voltmeter to choose, analog or digital, let me explain the difference between them. Analog multimeters are preferred to measure readings fluctuations. They do not have digital displays, which can make measurement a time-consuming process. However, analog meters have the ability to handle instantaneous changes in the quantity being measured. Digital multimeters are the most common type of multimeter today. They have higher accuracy but may not be the best device for measuring values that are constantly changing due to the delay in readings. So, it depends on your purpose to check the exact voltage or to check its fluctuation to choose between an analog and a digital meter. Very accurate information about the multimeters. I use the Extech EX330 Autoranging Mini Multimeter and I completely agree with the author that the absence of backlit is really a problem in low light conditions.